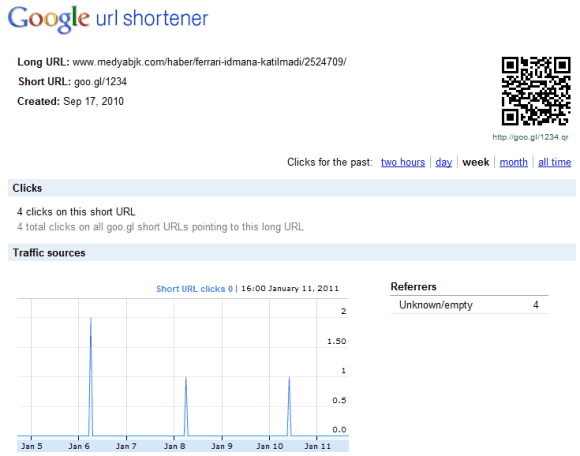 Google's URL Shortener has many advantages: it's fast (probably the fastest URL Shortener), it rarely goes down, it's integrated with Google Safe Browsing, it shows neat stats and it automatically generates QR codes. Unfortunately, Goo.gl didn't offer an official API and many application didn't support it. Services like Goo.gl, Bit.ly or TinyURL are rarely used directly: Twitter clients automatically shorten links, browser extensions create short links, while content management systems convert the links so that people can share them. For example, Google Maps, Google Reader and Google News use Goo.gl to create short links for all their content. Now other applications can use Goo.gl because there's an official API that's quite easy to use and has a generous limit of 1,000,000 queries/day. "You can use the Google URL Shortener API to programmatically interact with this service and to develop applications that use simple HTTP methods to store, share, and manage goo.gl short URLs from anywhere on the Internet," explains Google. The API lets you create short links, decrypt Goo.gl links, read stats and look up a user's history. Google's new API can be used inside the new Dev Console that lets you manage multiple APIs, add traffic filters and get traffic reports. It's very nice and helpful information and i really love it.